This is a painted hardcopy of the Han Bespin figure. It's made of a tan-colored casting material and is hand painted. Such painted hardcopies would have served as models for photography and promotional shows such as Toy Fair, and as paint masters, produced to illustrate paint schemes to overseas vendors. Hardcopies are really the true action figure prototypes--they're totally pre-tooling and made entirely by hand. 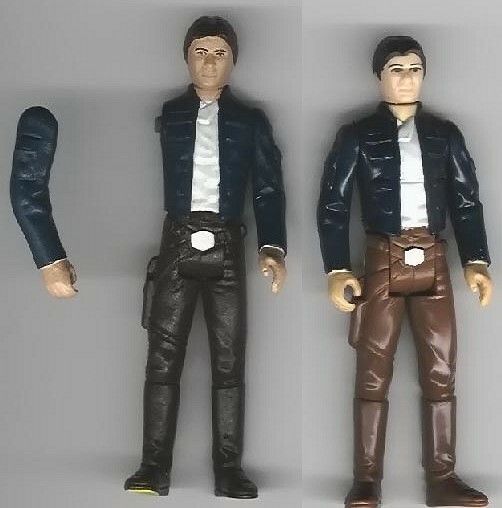 This Han is especially interesting because of the darker color of its trousers, which, as you can see through a comparison with the production figure at right, is quite different from the color eventually used in production.